Good morning and happy Wednesday! We always love when Wednesday swings around, because here on #ThatBusinessShow, Wednesday means it’s #WorkingWomenWednesdays! Which means that we have three wonderful guests from The Working Women of Tampa Bay Group! 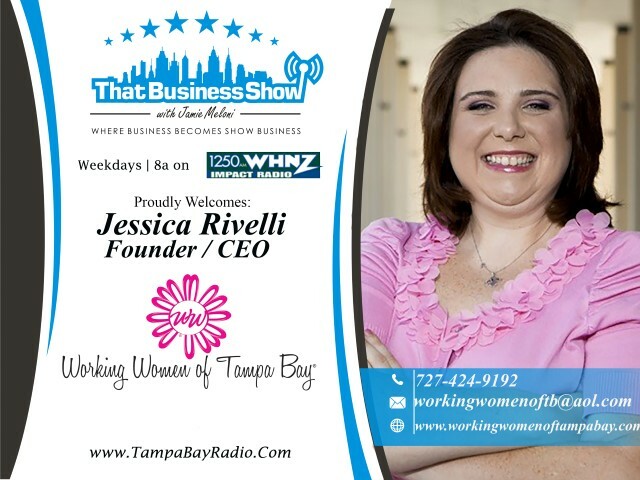 The Working Women of Tampa Bay Group was founded by Jessica Rivelli, who is also the CEO. Dedicating to forwarding women in all aspects, from business sharing, emotional and financial support, education, and all the way to political support, The Working Women of Tampa Bay Group is truly a great group for prefessional women to get behind. Our three guests from the group today on #WorkingWomenWednesday were Jaye Maddon, Owner of Epic Boxing and Fitness, and Personal Trainer Esther Solano with Epic Boxing and Fitness and inventor of the “Spoxing” method. Joining us on our second segment was Debbie Lane, Tampa Bay’s Hypnosis Expert and 2007 International Hypnotist of the Year! If you missed today’s episode of #ThatBusinessShow with Jamie Meloni on #1250WHNZ every weekday at 8am, head to http://www.tampabayradio.com to catch any show on demand! Alternatively, head to Jamie’s YouTube Channel athttp://www.youtube.com/jamiemeloni! 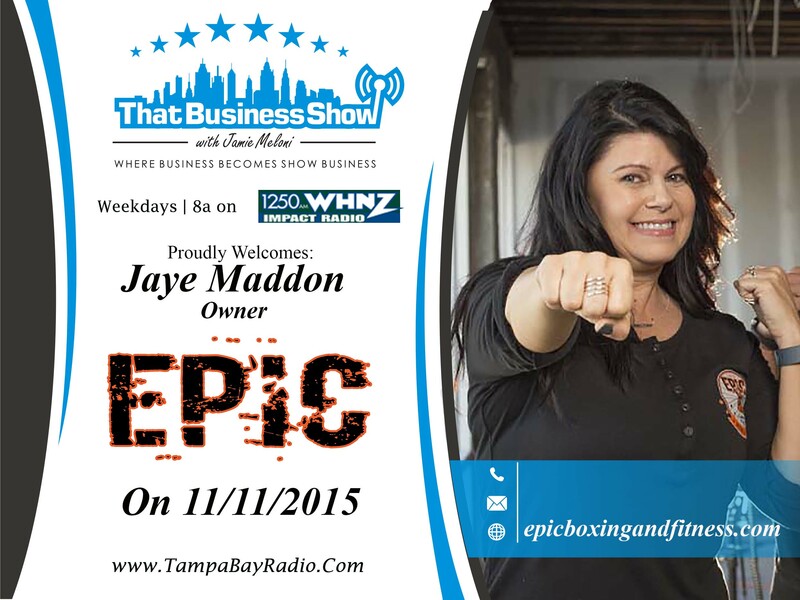 Our first guests on #ThatBusinessShow this morning for #WorkingWomenWednesday were Jaye Maddon, Owner of Epic Boxing and Fitness, and Personal Trainer Esther Solano with Epic Boxing and Fitness and inventor of the “Spoxing” method. Spoxing is a hybrid creation between spinning & boxing which creates a high intensity workout that gets you into a fat-burning zone quicker than any other workout! In Jaye’s words:”It’s down right Epic!” Coming on the show to further discuss the method, and also to discuss all of the programs they offer, make sure to listen to this segment on http://www.tampabayradio.com if you missed it! To find out more about Jaye Maddon and Esther Solano with Epic Boxing and Fitness, head to http://epicboxingandfitness.com/! Our last guest was renowned hypnotist, Debbie Lane, Tampa Bay’s Hypnosis Expert and 2007 International Hypnotist of the Year. Debbie was certified by the Naturalife Institute in Basic Hypnosis and Integrative Hypnosis in 2002. She is a member of the National Guild of Hypnotists, a member of the Hypnosis Education Association and an associate of the Unlimited Possibilities Hypnosis Institute. Debbie was previously a vice president of a national chain of child care centers, The Learning Center, Inc. She has combined her business, teaching and care giving experiences into a successful practice in Palm Harbor. Debbie Lane C.Ht. has experience with high-profile and complex cases. It’s no wonder that physicians refer their patients and the media has made her one of the region’s most sought-after hypnotists. To find out more, head to http://www.wisdomhypnosis.com!